Contemporary design meets traditional trullo at this country retreat with pool near Polignano a Mare. With its far-reaching views across gently undulating countryside, a garden of whispering olive trees, Zen-inspired interiors and a pulse-slowing infinity pool, Montaltini invites repose. After a couple of days of resting, however, you might like to take advantage of the property's strategic location and explore the area, from the beaches and towns of the Adriatic coast to the manifold charms of the Valle d'Itria. Inside: accommodation at Montaltini is spread over a contemporary main house and a lovingly restored trullo. The former is L-shaped and has been conceived to echo certain architectural features of the trullo, not least the white-bordered honey-coloured stone walls perforated by small windows. These aspects are subtly juxtaposed with modern elements including the dark wood cladding and large sliding glass doors of the central section. The main entrance takes one into an open-concept space at the right angle of the L, comprising a living area and a kitchen-diner. The living area is furnished with leather and steel armchairs and a sofa gathered around a fireplace, which is part of a horizontal recess hewn from the wall. The stylish U-shaped kitchen is topped by a luminous skylight and serves a long dining table looking out over the grounds. The wings of the L are given over to two separate sleeping quarters, each comprising a double bedroom, a double-twin bedroom and a shared shower room. Each bedroom has its own access to the surrounding gardens and a shaded sitting area. Smooth polished concrete floors and a zen-inspired minimalist palette of greys and browns run throughout the main house, making for a very restful, serene ambience. 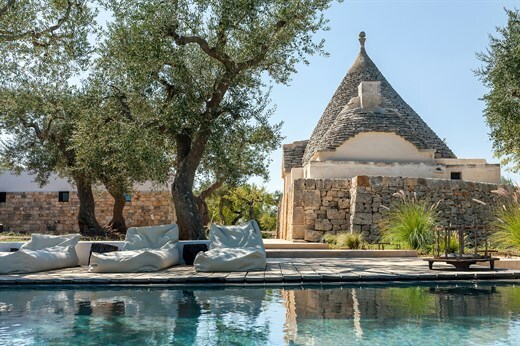 The trullo, which is situated about 20m across the gardens from the main house, has three distinct cone-topped rooms. The central cone at the entrance is furnished with a divan bed and provides access to the other cones, one on each side. The first hosts a double bedroom while the other is divided between a bathroom with WC and sink and an open (i.e. there is no door) shower room with sunken shower. Outside: the grounds of Montaltini are a classic synthesis of Puglian country living with a modernist touch. Sun-baked earth, planted with age-old olive and almond trees, is criss-crossed by white concrete paths connecting the two houses and a series of terraces. Dry-stone walls delimit the property and aromatic Mediterranean plants and shrubs scent the air. Accessed from the living area of the main house is a polished concrete terrace, furnished with easy chairs. At one end of the house is a great outdoor kitchen with barbecue, sink and work counters. A few steps away along one of the paths is the dreamy, well-shaded al fresco dining and lounge area, which overlooks the pool. The tempting infinity pool is bordered by wooden decking and sink-in sunloungers and offers wonderful views over the surrounding countryside. All the bedrooms in the main house have their own external access and shady sitting areas, as does the trullo. The main house's two distinct sleeping wings and the separate trullo make Montaltini ideally suited for two families or even two couples holidaying together. Montaltini features a fantastic infinity pool, offering swimmers great views while in the pool. There is a drop of the infinity side so precautions should be taken here. Please refer to our general safety page if you would like more information about infinity pools. Depending on the direction of the wind, the road running between Castellana Grotte and Conversano, which is 500m away, may occasionally be heard in certain areas of the grounds (though not from inside). Montaltini sits between the small towns of Castellana Grotte - renowned for its stunning cave complex - and Conversano. A short drive east will take you to the Adriatic coast and the gorgeous towns of Polignano a Mare and Monopoli. Both have lovely old town centres and the former is famous for its little beach, carved out from the surrounding cliffs. Monopoli has a lovely street market and some fine historical buildings. The underground complex of nearby Castellana Grotte comprises over 3km of subterranean paths, cathedral-high caves, stalactites and much more, all running about 60m below ground. A short drive inland will take you to the gentle hills of the Valle d'Itria, where you might visit the beautiful towns of Alberobello (a UNESCO Heritage Site thanks to its wonderful trulli-laden centre), Cisternino and, further south, the white city of Ostuni. All offer plenty to see, regular markets, as well as a good selection of bars, shops, restaurants and trattorie. World class sites a little further afield include the stunning baroque centre of Lecce. For golf enthusiasts, Montalitini is only 30km from an 18-hole golf course near Savelletri. "We didn't want to leave Montaltini because we felt so at home and good in this place: the house was just amazing." Montaltini was as per the images shown.The grounds and outside space was amazing. We didn't want to leave Montaltini because we felt so at home and good in this place: the house was just amazing with the caretakers so adorable and generous. Being used to travelling in luxury venues all around the world, I realised that only 3 hours from home I had one of the most extraordinary places ever!! What we enjoyed most about our holiday? Staying in the quiet garden of the villa around the pool. Haus und Aussenbereich insgesamt sind wunderbar.